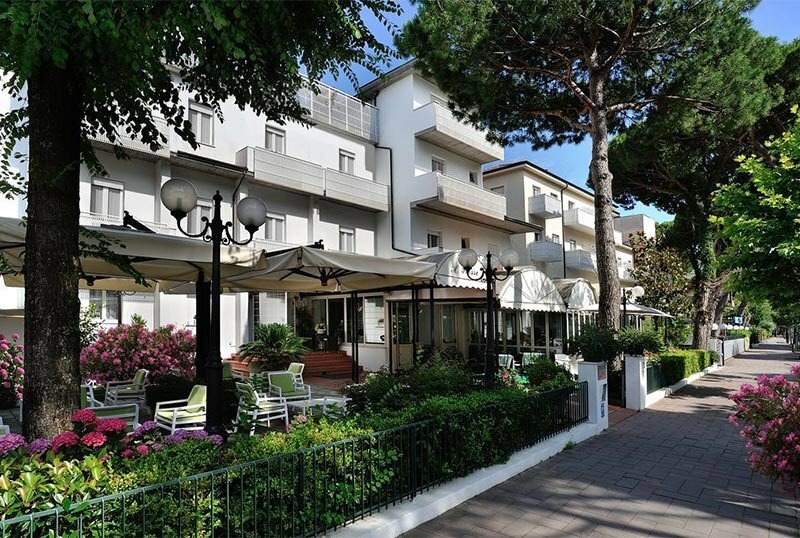 Hotel Suisse is a 3-star hotel in Milano Marittima, family-run for over 40 years. Private beach, garden, parking and WI-FI, kitchen for celiacs on request. No pets allowed. The property is located in Milano Marittima, a few steps from the beach, a ten minute walk from the central Rotonda Primo Maggio and the Pinewood of Cervia. Non smoking room with air conditioning, WI-FI, digital terrestrial TV, safe, telephone, desk, private bathroom with shower and courtesy set, hairdryer. Almost all with balcony, minibar on request. Garden, sun terrace, bicycles, reading room, satellite TV, lift, live entertainment with theme nights. On request private beach with umbrella and sun beds, laundry and ironing. CONVENTIONS : beach, amusement parks, discos, gym, swimming pool, spa, wellness center. Shuttle service for a fee. LUNCH AND DINNER : choice between three menus based on meat and fish inspired by the tradition of Romagna, with dishes revisited directly by the manager of the structure. Buffet of appetizers and vegetables, choice of regional and national wines, pasta and homemade desserts. Water and soft drinks included in the all-inclusive formula. VARIATIONS : available on request dishes for vegetarians and coeliacs. In hotel: live entertainment, baby sitter service and pediatrician on request. Hotel Suisse has an agreement with the Oasis Bath. Well-equipped bathing establishment with dedicated spaces and numerous services suitable for adults and children. 3 days at Parco Mirabilandia starting from € 529.00 per family! half board and tickets for 3 days at Mirabilandia. Give a gift to your family, Mirabilandia is only 8 kilometers from us. An opportunity to take on the fly! Last Second 6 nights in Hotel with Half Board Treatment; drinks with meals and Beach Service included. 10% discount on the purchase of 6 treatments. With Hotel Suisse as a Family, you will find the right dose of hospitality, hospitality and excellent cuisine. Last Minute July in Milano Marittima with free beach service. Make sure you stay at Hotel Suisse right away, just steps from the sea, close to the Papeete Beach bath, the Center and the renowned shops.